Every day Neil Hughes spends a few hours thinking like a two-year-old. He writes about his daughter Samantha's struggle with a childhood cancer - and posts the journal - known as a blog - on the internet. "It has been an emotional roller coaster ride since she was diagnosed, but the reaction to her blog has been fantastic," he said. Mr Hughes, 32, from Heanor in Derbyshire, has spent hundreds of hours creating the diary since last October. Two-year-old Samantha has a rare neuroblastoma and is receiving her chemotherapy at Queen's Medical Centre in Nottingham. The condition usually causes a solid tumour in the abdominal area. Her blog has been read by thousands of people since it started in September. The diary charts her progress and on 4 November she wrote: "I have been fed through a tube, had no sleep and am on five different medicines. But guess what? I am still smiling." Her father and mother Tina, 36, spend almost every hour with their daughter, alternating on the day and night shift. Both parents have stopped work to care for their daughter. Neil said: "I have already taken three months long-term leave from my job at a software firm - and Tina isn't working either." Their family has faced medical nightmares before when Samantha's five-year-old brother Louis was diagnosed with a tumour on his lung. It was removed and he has fully recovered. "We knew nothing about the illnesses when she was diagnosed so we turned to the internet and we saw others with online diaries. "I thought it was a great way to tell people about her illness so I decided to design one myself." Samantha's blog has attracted comments from all over the world, including Japan, South Africa, Austrialia and New Zealand - all in one day. "We've had a mixed response - some from those touched by cancer and others who come across the site by accident." He said one family in America discovered Samantha through a children's pen pal site called Post Pals and sent a Christmas box with more than 30 gifts inside. "Some days she is in floods of tears but the next minute she is fine," Neil told BBC News. Samantha writes in her 11 Janurary entry: "As you all know I am on my the 8th and final chemotherapy. At the moment but there is still a very long way to go in my treatment. "There are lots of tests to come to see if the chemotherapy has shrunk the tumour, and an operation to remove it and possibly a kidney too." Samantha's New Year's Eve blog said: "Everybody's preparing for new year celebrations and I find myself hooked up to many machines in my room which is not the rock'n'roll lifestyle I quite imagined. "Very upset again today and this round of chemotherapy really has knocked me back, and spent most of the day screaming and crying uncontrollably. " 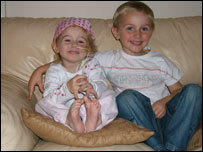 Samantha is currently waiting for surgeons to decide when the tumour can be removed.